Hot Dog Tots Recipe - Let me show how to cook Hot Dog Tots, you just need follow the bellow steps to cook Hot Dog Tots. 1. To a large saucepan add potatoes, salt and add water until potatoes are just covered. 2. Bring the water to a boil and cook until potatoes are fork tender. 3. Remove potatoes to a colander and run under cold water to cool. 4. Pour out onto a dish towel and dry potatoes thoroughly. 5. Using a cheese grater, shred the potatoes into a large bowl. 6. Add parmesan, flour and oregano to the shredded potatoes. Mix together. 7. Form the mixture around hot dog pieces to form tots. Freeze formed tots for 30 minutes. 8. In a large saucepan, heat oil to 175˚C. 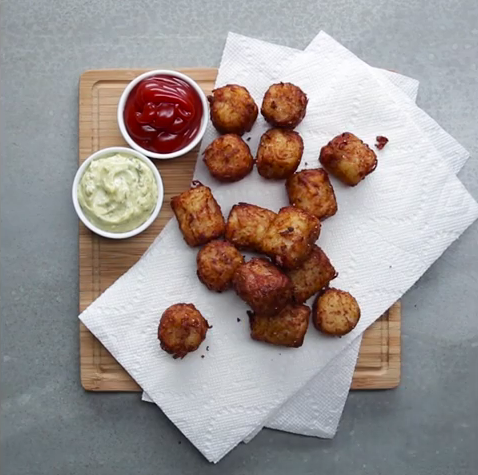 Fry the tots, in batches, until browned on all sides. Remove to a paper towel lined plate. Sprinkle with additional salt. 9. Serve with your choice of dipping sauces. Enjoy!